Stellenbosch Uni’s defence of Afrikaans wins day; but what’s true motive? “Enjoy the war, the peace will be much worse”. These words were spoken by a member of the Council of Stellenbosch University (SU) during a seven hours debate yesterday on a future language policy. A very ugly peace would have broken out had the university’s top management succeeded in getting their proposal accepted to make English the primary medium of instruction and communication and the compulsory medium of discussion at all university committees and assemblies. Afrikaans would have been driven out from the class and committee rooms, leading to a vicious backlash. 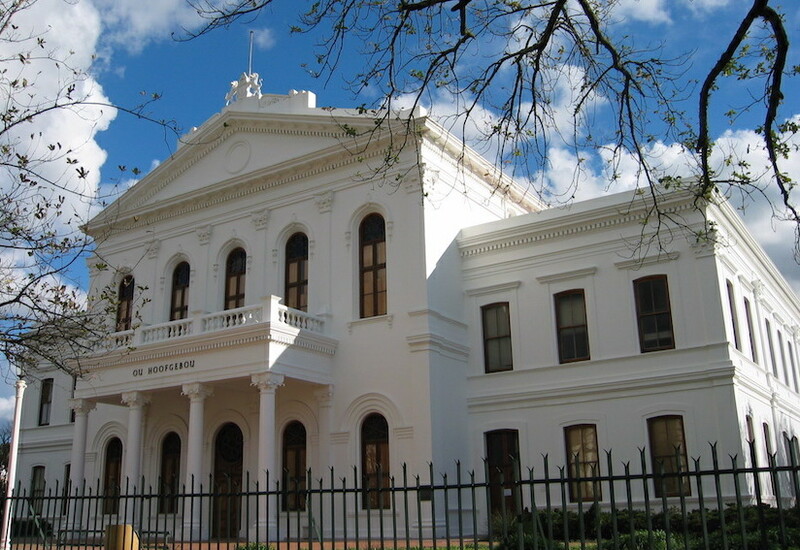 The Ou Hoofgebou (Former Main Administration building, now the Law Faculty) on Stellenbosch University campus. A year ago Council endorsed a policy in terms of which Afrikaans and English would enjoy equal status as a medium of instruction and communication. On 12 November the management suddenly drew a line through that language policy to come up with one that one that installed English – which it called “the common language of the country” – in a paramount position and even insisted that it could be implemented from early next year. Since the Council, according to the Statute, has the final say on the language matters the administration seemed to show it a middle finger. To make matters worse the Senate, made up of university professors, backed the executive, although it must have known that its vote was out of order. The Council, to its credit, refused to be intimidated. One-fifth of Council members were elected by the Convocation of alumni and the donors and they run the risk of being thrown out at the next election if they appear weak on maintaining Afrikaans on the campus. In recent times some illustrious public figures have suffered painful defeats in Convocation elections. In the Council meeting the threat of the executive being repudiated hung in the air but in the end sanity prevailed. It decided not to censure the Executive and to revert to the 50-50 policy for Afrikaans and English. What was completely unanticipated in 1994, when South Africa made its transition to an inclusive democracy, was that at the campuses of the Historically Afrikaans Universities Afrikaans-speaking academics and top executives would take the initiative in steadily reducing the Afrikaans offer. Narrowly pursuing their own individual or corporate interests, this group did not feel accountable to students, parents, clients or the Afrikaans community. Referring to their actions, Gerrit Komrij, a Dutch literary critic, in 2003 described Afrikaans aslewenddood (alive-dead). He pointed out that an elite was busily amputating limbs from Afrikaans despite the fact that the body was healthy, and indeed alive and kicking. He concluded that as far as the future of Afrikaans was concerned, the greatest threat to Afrikaans was Afrikaans-speakers themselves. Over the next twelve years Afrikaans-speakers had a leading hand in smothering Afrikaans on campuses where they were in a position of power. The mistake the present SU executive made was to try to get rid of Afrikaans as university language as soon as possible. One could also call it a blitzkrieg. What would have happened had the executive got its way? A pointer is a poll conducted in 2008 by Lawrence Schlemmer. Commissioned by the SU Council, he conducted a comprehensive attitude survey of the language preferences of Stellenbosch students. It found that only 15 per cent of Afrikaans would accept a policy that would make English the only medium of instruction and more than two-thirds would be very dissatisfied. More than 40 per cent of English speakers would regret it. At the other end of the spectrum stands Open Stellenbosch, a small, predominantly black pressure group that was instrumental in forcing US management’s hand. One spokesmen responded to Monday’s decision to revert to the 50-50 policy by calling the Council “incompetent” and “ignorant about transformation.” Another spokesman said that Council missed the chance to start the process of transformation but had chosen to preserve the status quo. In a certain sense we have a return of history. During the 1920s and 1930s when the two white communities referred to themselves as two different “races”, some English newspapers and politicians criticized the growing demands of Afrikaners for single-medium institutions as a form of ‘racism’. In recent times a similar dynamic had developed with bodies like Open Stellenbosch demanding the pleasure of devouring the Afrikaans lamb at Stellenbosch. For the moment the US Council has managed to ward off the threat. Hermann Giliomee was a student, lecturer and a Council member at Stellenbosch University and is also a founder member of the Afrikaans Alumni Association.